The Blast Zone Rock Crawler Combo Bouncer is ready to rumble! This is the Biggest Blast Zone Combo! Crawl on in through the Rock Crawler Bouncer’s front wheel, and get ready for a rocking good time! 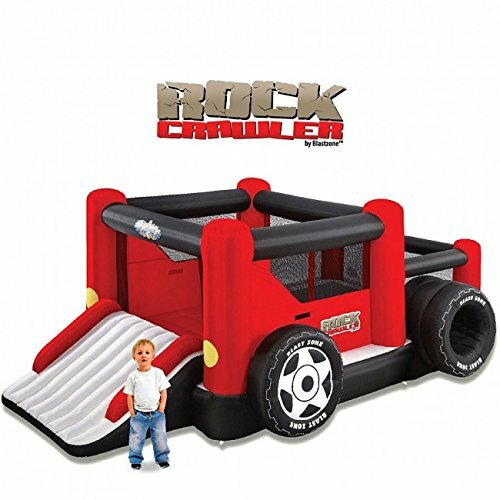 Up to 6 Kids can play safely with the Huge 18x11x7 Rock Crawler Bouncer at once. 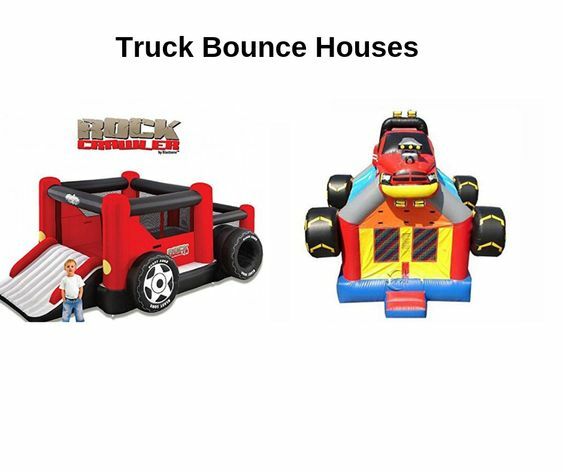 The Rock Crawler combo has tons of fun features to keep boys and girls entertained for hours: a ball pit in the engine compartment area, a crawl tunnel tire, a large bouncer in the cab and a 2-kid-wide tailgate slide. A large bounce floor, ball pit/play area and a low height make the Rock Crawler an excellent choice for indoor and outdoor use. Kids go nuts for the active theme of this Blast Zone Combo Jumper, and adults love the easy setup and compact design. Ball Pit, Bouncer, Slide, Crawl Tunnel! The Rock Crawler has a Double Wide Slide, for double fun. 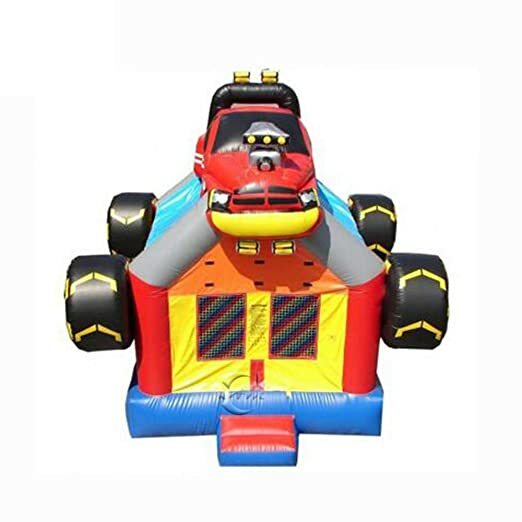 Blast Zone Inflatables are affordable, safe and fun! For as little as the cost of renting, your family can own your own inflatable amusement park, that will be used time and time again! Blast Zone products are in use in homes across the globe, and are designed to provide your family safe, durable fun and exercise. In just minutes, your inflatable adventure is ready to use. Simply unroll the product, attach the blower, inflate and stake down. The fan runs continuously, as kids play, providing the required airflow into the constant-air inflatables. Forget the expensive vacations, packing up the car and expensive trips to the amusement park. Make your backyard a wonderland, with your own Blast Zone inflatable! Blast Zone Inflatables are Exciting, Durable and Safe. These fun inflatables are designed in California, and meet or exceed applicable safety standards. Blast Zone’s Durable Inflatables include a number a specialized features, that are important to the Safety of your Children, and the durability of the inflatable. Construction features Include: Commercial Grade Impact Surfaces (Up to 9 times stronger than residential-grade), Double and Quadruple-stitched Commercial Assembly, 7-Stage Quality Control, Exclusive X-Weave material, for added durability, and more. Safety features include: Safe Slide Heights, Soft Safety Netting (Reduces abrasion), and Industry-Leading Warranty and support. Each Blast Zone Kit Includes everything you need to play: The Inflatable Play Park, UL Approved Blower, Carrying Case or Cinch Straps, Blower Stakes, Inflatable Stakes, and Instructions. Most also include a “Safety and Usage” instructional DVD. 1. Material: High quality 0.55 mm PVC material which is fire retardant and waterproof. 2. Characteristics: Fire-Proof, Serurity-Guarantee, Durable. 3. Technique: Double-triple stitch everywhere plus extra reinforcements by PVC stripes. 4. Inflatable time: Less than 5 minutes. 5. Usage range: Party, water park, zoo, in public, rentals, backyard, etc.Party, water park, zoo, in public, rentals, backyard, etc.